Once rampant in medieval Europe, leprosy dramatically declined by the end of the Middle Ages for reasons that are still unclear. About a century ago, leprosy in Europe virtually disappeared, at least among humans. 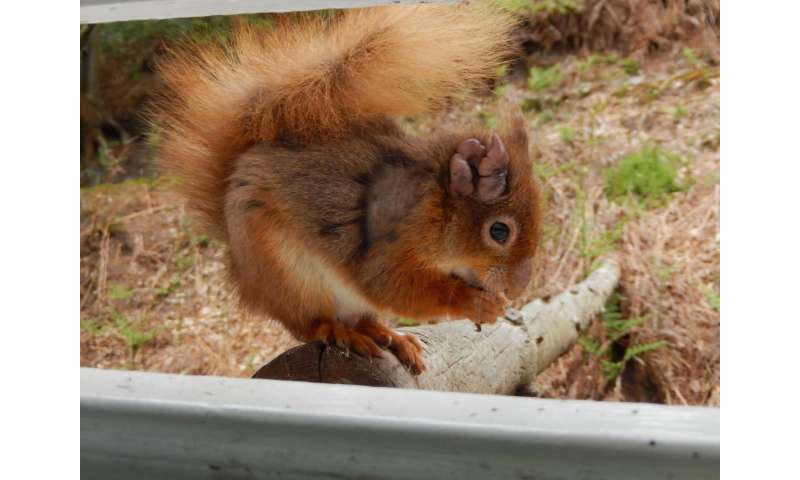 Examining diseased red squirrels from England, Ireland, and Scotland, scientists at EPFL and the University of Edinburgh have now discovered that the same bacteria that cause leprosy in humans also infect red squirrels. The work is published in Science. Leprosy is an infectious disease that mainly affects the skin, peripheral nerves, the upper respiratory tract, and the eyes. It is caused by the bacteria Mycobacterium leprae and the recently discovered Mycobacterium lepromatosis. One of the most ancient diseases, leprosy has had an enormous social impact across multiple cultures throughout history. Largely controlled today thanks to antibiotics, there are still over 200,000 new cases of leprosy reported each year worldwide. A little-known fact is that leprosy also affects animals, such as armadillos, which have reportedly caused a few cases of animal-to-human (or "zoonotic") infections. Drawing from this evidence, the labs of Stewart Cole at EPFL and Anna Meredith at the University of Edinburgh carried out DNA tests on 110 red squirrels from England, Scotland, and Ireland. Some of these animals showed clinical symptoms of leprosy, while others did not; nonetheless, most were found to be infected with leprosy bacteria. Surprisingly, red squirrels from Brownsea Island, off the south coast of England, were infected with a strain of M. leprae that is closely related to one found in a skeleton of a leprosy victim that was buried in Winchester 730 years ago, just 70 km from Brownsea Island. On the other hand, red squirrels from Scotland and Ireland and the Isle of Wight (South England) were found to be infected with the other leprosy bacterium, M. lepromatosis. This species causes leprosy in humans in Mexico, and further analysis showed that the two strains from Mexico and Europe diverged from a common ancestor around 27,000 years ago. "It was completely unexpected to see that centuries after its elimination from humans in the UK M. leprae causes disease in red squirrels," says Stewart Cole. "This has never been observed before." The study shows how a pathogen can remain undetected in the environment even hundreds of years after it has been cleared from the human population. "The discovery of leprosy in red squirrels is worrying from a conservation perspective but shouldn't raise concerns for people in the UK," says Anna Meredith. "We need to understand how and why the disease is acquired and transmitted among red squirrels so that we can better manage the disease in this iconic species." But is there a danger to humans? "There is no reason for panic," says Andrej Benjak, one of the paper's lead authors. "Autochthonous leprosy has not been detected in the UK in decades, though we cannot exclude the possibility of rare, unreported or misdiagnosed cases that originated within the UK." He suggests increasing efforts to monitor the disease, as part of the WHO's global Leprosy Surveillance Programme, where there is still room for improvement. "The next logical step after this study is to check the red squirrel population outside the British Isles, and that includes Switzerland," says Benjak. "Even if there is leprosy in red squirrels in continental Europe, the risk of transmission to people is generally low because of their limited contact with humans, and hunting red squirrels is forbidden in most European countries."